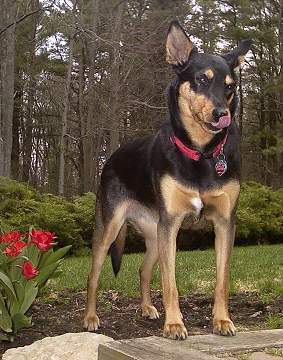 Owned by Sallie and Scott in the U.S.A.
Noonbarra Krypto was sold to America as a companion dog in Boston. She was a very intelligent dog but also quite obedient and we felt would fit in well with her new family. She was named after Superman's dog and is a bit of a superdog herself! She has an easy-going personality and a brilliant mind." Sallie writes; "Mary and Stephen, Adorable Krypto is here. She is utterly delightful. She has been playing, running, eating, and getting cleaned up. (She does love to eat!) Thank you for all your efforts. Krypto spent a fruitful 15 minutes pulling and pushing doggie beds around the living room. 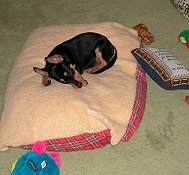 After she exhausted herself, she settled down to sleep next to, not in, the doggie bed. That will be your first photo of her! Tomorrow I will let her rest while I finish my chores here in Los Angeles. On Thursday she and the other two dogs will fly to Massachusetts. The two dogs here -- a papillon mix and a Japanese terrier -- have accepted Krypto. They are playing a bit and sharing rawhide chewies. Stephen and Mary, Krypto has grown so much in just two weeks. What a clever dog she is! She is doing very well in asking to go outside when need arises. She sits down on the scatter rug by the front door, or jumps on my lap and gives a big kiss on the nose as if to say, "OUT!" for example, the chimpanzee that chatters or the parrot that sings when squeezed. Krypto also has been moving small, empty boxes around the house. She loves to drag boxes onto the couch in the living room and play with them. One wonders what she is thinking of! like a miniature sheep with her wintertime long hair (Spikie has a springtime grooming appointment this Friday so will no longer look like a sheep). Krypto has adjusted well to the snow. 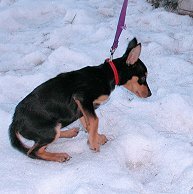 Just now it is warming a bit, and as the snow pulls away from the bare ground, Krypto is so interested in the damp earth and vegetation. Krypto also met the deer who live in our yard. Krypto is signed up for puppy kindergarten classes starting March 30. The local trainer is supposed to be excellent, and we hope to continue with her in advanced obedience. She has charmed everyone at the vet office, and is in perfect health. Krypto is so wonderful, and we are so happy with her. Krypto is not only gorgeous but also smart! She is following Spikie's lead about what to do. Krypto loves snuggling with people and is a delight. Krypto is quiet through the night. What enthusiasm she has for pleasing people. She knows to come when called, and can "sit." I am working with her on "stay." We will be signing her up for "puppy obedience" classes this week. I mentioned that she flew in a private jet. I took photos of her in her luxurious surroundings. The pilots took turns holding her, and giving her biskits that they brought especially for her. Krypto is doing well in the snow. It is a great adventure to her. We are so grateful for a perfectly wonderful kelpie! Krypto graduated from Puppy Kindergarten with great grace and aplomb. She complies with her commands extremely well, including "down" and "come." Krypto is a splendid dog. She is so intelligent that I expect her to get out the frying pan from the cabinet and cook eggs one morning for breakfast. Krypto likes to count the dogs when they return from outside. She also minds that they do not wander too far, or get into trouble. Krypto weighs about 25 lbs., and always draws compliments on her beauty. We will send a picture soon. I do not mean to imply that Krypto is not without challenges. She does like intelligent play, and she has started frisbee. 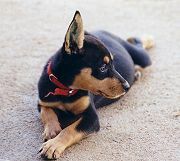 she does that, it is I who must be obedient (or be stared down by a stubborn Kelpie). She is a "larrakin" and a sprite at the same time. Speaking of "larrakin" -- we had read a delightful description you wrote on your website of Krypto's brother Zack. Do you have that description, and would you mind emailing it to us? Zack sounds very much like Krypto, and we would like to print it for Krypto's file. 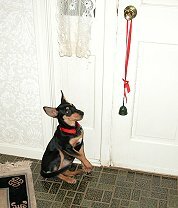 By the way, Krypto says she is thrilled that she has trained us with the bell hanging at the front door. A long-overdue note to tell you that Krypto is an extraordinary dog. She started Puppy Kindergarten two weeks ago and has been performing well at Sit, Wait, Down. Her house-training has been perfect for about a month (since 3.5 months age). She would ask to go outside by waiting at the front door. So I decided to hang a bell on a ribbon at the door. That way Krypto could signal us if we happened not be within view of the door. She needed no training to understand the use of the bell. The bell chimed for the first time when I opened the door for her trip outside. About two hours later I heard the bell. There was Krypto sitting at the door, ringing the bell to be let out. She was not just playing with the bell; she did need to go out. And Krypto has been perfect about the bell ever since. She has taken it seriously, never as a toy. We have been going on 4-mile walks every day. Krypto loves the ducks down at the river. She is very interested in birds flying, too. 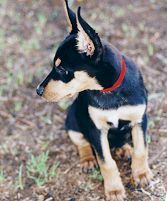 "When Krypto kelpie was a puppy I hung a red ribbon and bell on the front door so she could alert me that she needed to visit outside by ringing the bell. door open. She not only lets herself out, but also lets the other (smaller) dogs in when they ask. tried and catalogued every door in the house as to whether she can open it. 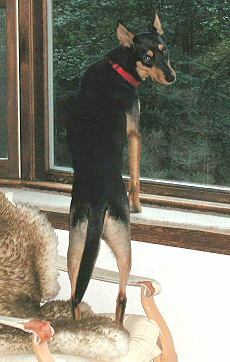 "Stephen and Mary, Attached is a photo of Krypto taken yesterday; she’s nearly 11 months old. She’s 19 inches tall at the shoulders, and has elegant, long legs. Krypto finished her obedience training with a certificate and graduation biskit. Krypto's natural genius for herding has been shining now for several months. She keeps watch over the other dogs, and always knows where to round up anyone lingering outside. She won’t come back into the house until all the other dogs are inside. During the summer a flock of wild turkeys ventured into the yard. Krypto herded them carefully together to protect them; I had to call her away so the turkeys could travel through without Krypto’s help. Her favorite toys are the fuzzy stuffed animals with microchips in them that "talk" when the toy is squeezed -- for example, the chimpanzee that chatters or the parrot that sings when squeezed. Krypto also has been moving small, empty boxes around the house. She loves to drag boxes onto the couch in the living room and play with them. One wonders what she is thinking of! Spikie gets along well with Krypto...Krypto has adjusted well to the snow. Just now it is warming a bit, and as the snow pulls away from the bare ground, Krypto is so interested in the damp earth and vegetation. Krypto also met the deer who live in our yard. She has charmed everyone at the vet office, and is in perfect health. Krypto is so wonderful, and we are so happy with her. Stephen and Mary, Krypto will be two in December, and she is wonderful. She has an easy-going personality, and a brilliant mind. On her own she decided to become the nanny for the other dogs. For instance, if it is bedtime and I call the dogs to the house but one of the dogs has gone exploring in the woods, Krypto won't come in the house. She'll stand at the door and alert me with a little "hmm, hmm, hmmm" sound. So I take inventory of the dogs present, and then tell her, "Go find Jennie" (if Jennie is the missing one). Krypto will sniff the air, and then dart off into the woods; in a minute or so she will be herding Jennie home. Another good trick Krypto learned on her own is to open doors by turning door knobs and pushing. This works if a door opens outward, in the direction of her push. Yesterday one of little dogs, Alfie, was waiting for me to get to the front door to let him in, but Krypto arrived first. She just stood up, batted her paw against the door lever, and then swung the door open for Alfie. As colder nights return to New England, Krypto tucks herself under the blankets with me. Krypto is extraordinary, from her sweet personality to her clever mind. These comments were posted on a internet email chat line about Noonbarra Krypto. 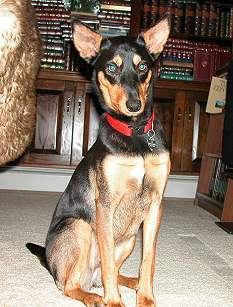 Krypto is a two year old black/tan kelpie living in New England; I added her ancestry to the group database. Smart, peaceful and sweet, she works as a companion animal. On her own she decided to herd the flocks of wild turkeys that come through here. Krypto also decided to be nanny to four rescued dogs that are rehomed here. Krypto will stay outside at the door until the other dogs come in and will even alert me with a "hmmm, hmmm, hmmm" voice if one is absent; she then will go seek and find the dog if asked where the missing dog is. And Krypto showed special care to an 18-year old rescue (who recently died) by washing the elderly dog's face each morning and evening. I look forward to agility classes with Krypto this summer. I shall try to post pictures soon. Mary and Stephen, I've not written in many months. Attached are several photos of Krypto while she is resting. I'm not photographer enough to capture her in action. Krypto and I started this summer agility and obedience. Krypto's eyes sparkle when I gather her equipment for class. She's happy to greet the other dogs. At the end of a practice run Krypto flashes that wide grin and wags her tail as she trots back to collect her treats. She enjoys it so. Krypto in an agility demo at the oldest agricultural fair in the United States -- the Topsfield Fair. Krypto was asked to show off her beginner-level skills. The Fair Demo meant to please the audience, and was not a competition. (Krypto also did Rally-Obedience Demo at the beginner level for the fair goers.) And in the Knock-Out Races -- where the agility course is divided in halves, and each dog starts at the same time and first dog to finish at the table wins; the races are crowd favorites -- Krypto won. Karen and gives her a big kelpie hug at the start of every class. treat by doing the agility obstacle correctly. And while the humans are listening to a lecture, Krypto will slide down to rest on her side for a brief nap, because she is conserving energy. knowing, pretty smile and tail wag. Yes, she got a treat for that trick! 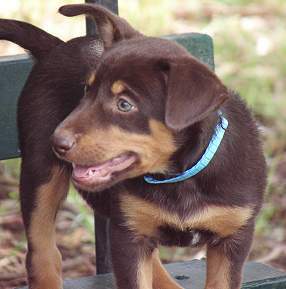 In early 2007, Sallie purchased another Noonbarra Kelpie. 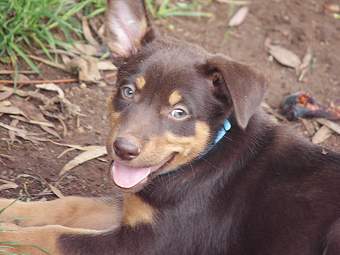 This was a red & tan male called Noonbarra Sky. Like Noonbarra Krypto, Sky too is a very clever dog. Even though both dogs were sold purely as companion dogs, Sallie decided to try her hand at herding sheep a little while after getting Sky. Her sheepdog instructor is from Ireland and has had extensive experience in training throughout Britain and now in America. He has been pleasantly surprised by the high amount of natural ability the Noonbarra Kelpies have shown. 2009 : Speaking of Krypto, she earned her agility Championship title last weekend -- 40 Quallies at the highest level of difficulty. Krypto is working on another title, called Extraordinaire, which requires approx. 180 Quallies at the highest level, and earned without incurring any faults. Good Krypto has already 50+ of the Clean Level Quallies. We have more information on Sky as well as Krypto in the section below. Mary and Stephen, Sky is a beautiful dog! I had an educational adventure at cargo/imports/customs last night. There was a pomeranian also traveling on the same flight, so Sky had company. I had brought along the gear to clean long-travelling Sky in the nearest lavatory sink. While he was getting scrubbed he stared at the handsome fellow in the mirror above the sink. He turned his head one way then the other as if to admire his handsome visage. The first thing Sky did upon reaching home here was to explore the snow, paw it and sniff it. Clever fellow! Sky was thrilled to meet the other dogs, especially Krypto. Unseasonal snowfall over the weekend, and Sky found the white snow blanketing the outside intriguing. He leapt, tumbled, sniffed and tossed it with his nose. 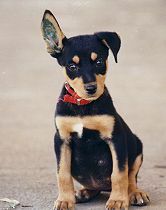 playpal, although he will play with the two (older) terriers if they respond. I've gotten new toys and Sky is thrilled with one ball that lights up and whistles when it bounces. He's been batting it against the wall; maybe I should buy him a cricket bat. You must have taught puppy Sky extremely well before he left for Boston. At his first Puppy Kindergarten class yesterday Sky did Sit, Down, Wait (for 30 seconds) and Leave It with little extra prompting. 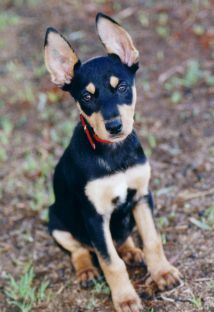 The instructor quietly exclaimed to me that she had not seen so smart a pup (but this is her first meeting with a kelpie puppy). Dear Stephen & Mary, I read on the website that you are back home, and that is wonderful news. We hope for every best success with Stephen's treatment, and send fond thoughts to both of you. You already know that Sky is an incredible dog so I best explain what he's been doing. I enrolled him immediately after his arrival in Puppy Kindergarten and the instructor of 30+ years' experience in dog training asked me to write to you and report that she has never met a smarter pup. She also likes the way Sky pays attention in class, and looks to me for direction. She also noted Sky's herding instincts during puppy playtime at the start of each class when he pushed his puppy classmates in a corner without barking, just moving and staring. 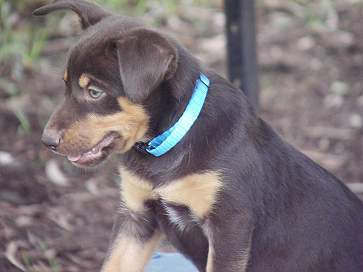 Sky has that low-slung kelpie stride when he works the pups. The instructor likes the way Sky does the "Leave It" command. She tosses a biskit at his feet while he's in a Stay and tells Sky to Leave It. He wrinkles his brow and starts boofing at the forbidden biskit as if it were naughty. Sky's been promoted to intermediate class where we will consider more complex work. And a note on Krypto -- last Saturday she completed her Level 1 title in agility (there are five levels in our league and we look forward to them all). Krypto has gotten speedier, and she achieved her eight qualifying scores with zero faults in any of the games (our league allows some faults for some games). Moreover, for each qualifying score Krypto also won a first, second or third place ribbon denoting her placement during each competition. Krypto works from my body language so I hardly say anything to her when we run, and as a result Krypto is lovingly known as the mind-reading kelpie. She can run extremely tricky paths and is very good at her level of experience at distance work, which saves me running effort. First, warmest regards to Stephen, and wishing him best success in treatment. Second, I never thought I'd be writing to you about herding, but here we go. Two weeks ago I attended an all-day Sheep Herding Clinic -- for novice to advanced -- in New Hampshire. At the last minute I decided to bring along puppy Sky (now a handsome, tall dude at 7 months old) to accompany Krypto (4 years old). The instructor encouraged newcomers and novice dogs, and part of the clinic was spent evaluating new dogs for their herding tendencies. The trainer asked me to write to you and mention how talented the kelpies are. He wishes me to tell you that he has worked stock since WW2,and is from Belfast. He runs strong border collies, and his experience with kelpies was limited, and he admitted to me at the outset of the clinic that he wasn't expecting to be surprised by my kelpies Krypto and Sky (I like the instructor's plain, direct talk). Within ten seconds of seeing each dog in the round pen the trainer declared, "Both kelpies have what it takes to do herding." Since then I've been back to the herding school for several lessons. I loaned him the trainer precious copy of your Kelpie Basics, and he raved about it. "Noonbarra and I think alike on what makes a good dog!" Please excuse my poor terminology in trying to describe the following things to you -- because I'm new to herding I scarcely know the terminology. While I know little about herding, the kelpies know plenty. We've so far worked only with sheep. Krypto is stately. She knew instinctively to hold a wide distance, and is highly efficient. During our circling exercises, she quietly clumps the sheep and then folds into a Down/Stay without being prompted. She is speedy when gathering. Krypto had a humorous Clint Eastwood/Dirty Harry moment at yesterday's lesson, when one of the bossy ewes tested her. She hunkered down and gave that fiery stare, "Go ahead, ewe, make my day!" 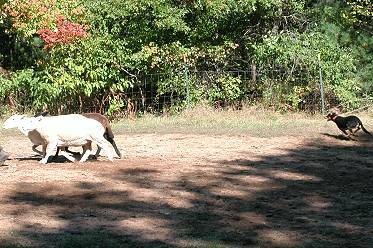 That ewe danced her hooves back to her buddies as fast as she could, without a bark from Krypto. 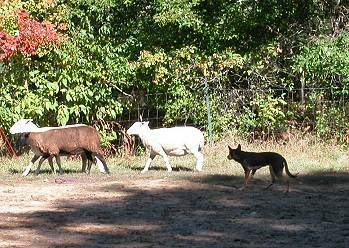 Krypto quickly gets the sheep to settle and graze, and rarely needs a correction from me. Sky puppy is certainly more puppishly exuberant compared to Krypto. The instructor, while happy to test a puppy for herding aptitude, prefers to train a pup on stock after the pup is one year old. Sky is his delightful exception. The instructor described Sky as "afire" "extraordinary" "powerful" "unafraid" "smart" "quick learner" and similar descriptions. galloping and puppy-ish dive bombing play on the sheep, as in the first meeting. The trainer notes the kelpies are extremely thoughtful, and learn and think about their lessons, and are progressing rapidly. Yesterday while I was leading Sky puppy in circling exercises around the sheep the instructor asked me to hand over the wand and step away, because "I think I see something wonderful in the pup," he explained. upfield, with Sky marching backward. Next he and Sky walked downfield, with Sky "balancing the sheep." The instructor was pleased with such work from a 7-month old pup, and asked me to relay that to you. 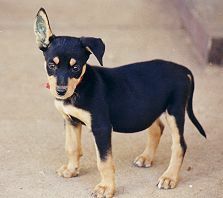 The instructor encouraged me to take both kelpies to sheep trials next summer; I'll try -- although I have much to learn. The trainer also cannot wait to see Sky work cattle. Should the instructor in the future seriously work cattle, it would be, he says, with a Noonbarra kelpie. Dear Stephen and Mary, I wish Stephen all the best in his treatment and recovery. Noonbarra Krypto and Sky went to the closing Sheep Herding clinic for the year two weeks ago. The instructor asked me to write to you once again and to report that in his words, Sky is "a phenomenon" at herding. Recall that the instructor has been herding since the early 1940s. The kelpies had several herding lessons over four weeks in August, wrapping up with the above-mentioned clinic, which is an all-day school with several dogs and handlers. In those four weeks the instructor has noted that the Kelpies have not only absorbed each lesson, but have thought about what they learned, and then applied what they learned to the next lesson. Krypto has a lovely, wide style, and likes to finish her work efficiently and lie down in the shade, strategically placed so that the sheep cannot drift upfield to their pen. Clever Krypto! Krypto is unafraid to get in a ewe's face when necessary; otherwise she appears a princess -- but that's only a disguise. In the last herding lesson, Krypto smoothly wove and balanced the sheep while I walked backwards down the field (Krypto and I facing the sheep, which were balanced between us). That day's lesson, belonged to Sky, though -- he was holding calm and steady while balancing the sheep, so I decided to face forward. It was a bold decision, as Sky is not immune to puppy-ish gripping games if he sees I am not paying attention and thinks he might succeed at his dive bombing run. But Sky stepped into his Big Boy paws -- as I faced forward and stepped and turned, Sky became all serious and balanced the sheep so we could thread between fencing, through cones, all the while traveling upfield, then downfield. While I didn't see it, at one point the instructor, who was giving ongoing commentary to the class about Sky while we worked, said that one ewe was thinking about bolting from the mob -- the teacher had seen the ewe's eye glance sideways. The instructor told the class that a young, inexperienced pup would then face a dilemma about how to regroup the sheep. But before the teacher could explain further, Sky, who had also detected and read correctly the ewe's intention to bolt, deftly stepped slightly off balance to cover the ewe, who then tightened into the group. Sky then calmly stepped back into balance. I had not seen Sky's covering the sheep, as it was later recounted to me. But the instructor, when we returned to the class bench, had the widest grin on his face and said then only one word about Sky's performance, "Impressive." After class the instructor asked me to write you again and say that Sky is "a phenomenon," and that the instructor has never seen a pup so young (7-8 months) work with so much maturity and skill. Both dogs I hope will be working towards herding trials next summer. The instructor also reports that both kelpies have beautiful skills for work on cattle. A herding update -- Krypto and Sky found another wonderful instructor. The teacher comments that he appreciates seeing great raw talent in a breeding line. Attached are two photos from the kelpies' third lesson. Sky at 9 months old is almost ready for the "big field." Sky reads stock well, is working "heads to handler," and shows excellent pacing on walk-ins. Krypto is only a few weeks behind Sky; Krypto is still getting to know the instructor. At the next lesson the kelpies worked eight tougher sheep. Just a brief word about Sky puppy. Last week his current herding trainer (our second trainer while the first -- the man from Belfast -- overwinters in Florida) asked me to stop training Sky in pre-agility because "herding is his destiny." I agreed. You already know that the first trainer said that Sky is "a phenomenon." The combined experience of the first and second trainers in herding (and both manage stock for lifework) spans ninety years. While both men are devoted breeders of border collies, they have come to appreciate young Sky as a magnificent stock dog in training. Sky's majestic work Sunday had to be explained to me. During practice the trainer was using approximately ten particularly hard-minded sheep that require a definite presence for the dog to Git them to the handler. And, whatever the handler is emphasizing in his lesson is added to an ongoing scattering of the sheep so that the dog knows it must always be mindful of watching the stock and holding them together. Once in Sunday's lesson the handler scattered the sheep and one ewe sped away over two small hills and out of sight. Puppy Sky grouped the remaining sheep, then, without prompting, went to find the missing one, drove it to the mob and calmly walked all the sheep to the handler. The instructor honored Sky by calling him "an honest dog" -- meaning a dog that will take the effort to bring all the sheep to the handler, not just most in the hopes that most will be good enough. During the training I was watching the lesson but the distance and terrain prevented me from seeing the full episode play out in the sheep field. All I saw were the sheep being scattered, then Sky's ears headed over the two distant small hills, in what I thought was a puppishly wrong direction. I imagined that next I'd be hearing the corrections, "Lie Down, you!" and "That'll Do!" ringing over the fields. When I didn't hear the corrections, I wondered what could be happening. But next Sky's ears returned over the distant hills, after he had located and gathered the missing stock. Later the trainer explained Sky's actions to me. Thus it seems that herding is in my future, too! Late-breaking news -- Sky's scores were high enough at our second trial that in one run he earned the points to qualify to enter the New England finals for Novice dogs, to be held in mid-September in New Hampshire. Of course I quickly sent his entry and booked a room for the event. When I wrote to you that one judge assessed Sky as a great, great, dog," I had shortened the complete sentence of the judge's opinion. The full statement was, "He is a great, great, dog, and let no one tell you otherwise." The last phrase indicated encouragement in a b/c world. I went to two trials in the past five days -- I didn't wish to do the traveling, but the schedule worked that way in terms of the best opportunities. The first was 600 km away, in an agrarian area, with many excellent handlers at the Novice level (I was over my head as it was a State Championship competition, even at our beginner level). ISDS rules. At Novice there is 100+ yard outrun, fetch around the post, drive to a gate, and pen. I just returned from another trial this weekend, with many of the same competitors, approx 350 km distant. Sky earned 6th place and 4th place ribbons!!!!! My trainer knew all that, and is pleased that his border collie colleagues recognize a good stockdog no matter the breed. I see the training gaps as a result of competiting, and I don't see the need to go to more trials at present; perhaps next spring.